Can you keep the water from falling down? Let’s make an experiment using simple household materials and try to defy gravity. We will try to hold the water in an upside-down glass and keep it from falling. Also, you will understand the science behind it. Fill the glass with water completely. Take a flat sheet of cardboard and place it over the mouth of the glass. Hold the cardboard with the glass tightly, then quickly upside down the glass. Slowly take away your hand that is holding the cardboard. If all goes correctly, then the cardboard will stick to the mouth of the glass. The water will not fall from it. So, you’re thinking what is happening here! It all happens due to the absence of air in the glass. 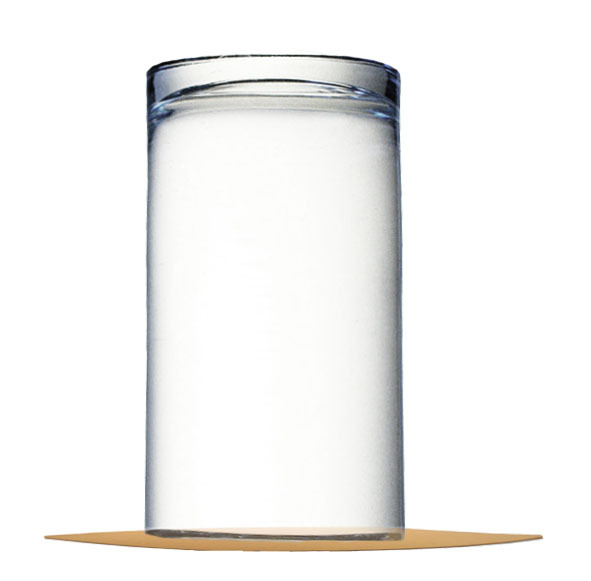 As a result, the pressure of outside air is much greater than inside of the glass. So, outside is forcing the cardboard to stay in its place. Which in turn, keeps the water from falling. Try to use different kinds of paper sheets and use it in the place of the cardboard for hold the water. Observe which paper sheet is able to hold the water. Use glasses with the wide and narrow mouth, and find out which is easier for this experiment. Abdul Wahab, "Water in Upside Down Glass," in Science4Fun, April 13, 2019, http://science4fun.info/water-in-upside-down-glass/.